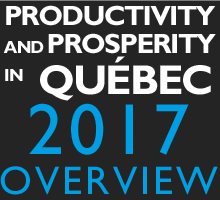 The Centre for Productivity and Prosperity – Walter J. Somers Foundation (CPP) today released its 2017 edition of Productivity and Prosperity in Quebec – Overview. In keeping with a tradition started in 2009, the CPP report updates a number of indicators that draw a portrait of Quebec’s economic situation. For CPP Director Robert Gagné, who co-authored the report, the province’s economic health remains precarious. “I don’t want to paint too bleak a picture, but the situation really hasn’t improved in recent years. With a standard of living barely higher than $47,000 per capita in 2016, Quebec still trails the pack as compared with the other Canadian provinces and 20 of the main Western countries.” Only the Maritime provinces, Spain and South Korea have lower standards of living. The authors of the report have been analyzing the province’s economy since 1981, and have seen the origins of Quebec’s lagging economic performance change over the years. In the 80s and 90s, the standard of living gap with the other provinces and countries studied was essentially due to the major recessions during those periods. Since the early 2000s, though, the gap has continued to widen, whether or not the economy has been battling a recession. The relatively slow growth in Quebeckers’ standard of living has had serious consequences, as they have seen their purchasing power shrink steadily. In fact, their disposable income is now lower than that of residents of the other nine Canadian provinces. In 2016, Quebeckers had an average of $4,370 less than Ontarians to spend and save.